Chhattisgarh Professional Examination Board is going to conduct the Sub Engineer written test on 9th September. Hopefuls applied for the CG Vyapam Sub Engineer posts will have to download the admit cards to attend the examination. The CG Vyapam Sub Engineer hall ticket will be accessible to download on cgvyapam.choice.gov.in. All the hopefuls must download the admit cards to continue with the examination. The CG Vypam written test will be held at various examination centers across the state. Hence the hopefuls can check their examination venue details after downloading the admit card. Also, other major instructions to proceed with the examination will be given on the admit cards of aspirants. Candidates who miss carrying the admit cards will not be permitted to sit in the examination. Hence the hopefuls must carry the admit cards without fail while going to the test. For more details regarding the hall ticket release date, and other guidelines the applicants can go through the following article. Chhattisgarh Professional Examination Board is also known as CG Vyapam is the state government board that controls various stage government related works in Chhattisgarh. The authority annually issues various job notifications for state-government posts. The organization has recently announced 103 Sub Engineer posts. Aspirants waiting for Chhattisgarh Sub Engineer notification have applied from 3rd August to 19th August. Though the organization announced less number of posts this time, thousands of aspirants with the relevant qualification have applied for CG Vyapam Sub Engineer posts this year. The suitable aspirants will be shortlisted through the written test and interview rounds. Hopefuls need to clear all the rounds of the selection process with good merit to get the job as SE in Chhattisgarh. The competitors initially need to attend the Sub Engineer examination on 9th September to shortlist for the next rounds. Aspirants can download the hall ticket from the CG Vyapam official website, cgvyapam.choice.gov.in on 1st September. Check the details of examination venue, date and time of examination from the hall ticket after downloading it. candidate’s name, register number, father’s name, signature, scanned photograph and other details will also be printed on admit cards. Recheck all the details once after downloading the hall ticket. If any printing mistakes appear on it, the applicants can approach the CGPEB authorities through the mail, phone, and other helpline facilities provided. It is important to carry the admit card as well as any of the valid identity proof while going to the examination. The examination officials are going to examine the identity card and hall ticket of the person. Candidates are also advised to report 30 minutes before the examination. Latecomers will not be allowed to take part in the examination. Go in “Latest News” section of CG Vyapam official website. 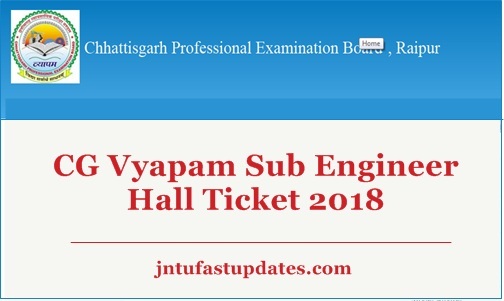 Search an appropriate link of Sub-Engineer Exam admit card 2018.